5G Brasil is a Private autonomous project under Telebrasil umbrella. Telebrasil is a private association with 65 institutions members whose main objective is to represent the interests of the telecommunications sector in Brazil and to promote its development. 5G Brasil has 20 associates (institutions), including industries, universities, research centers, telecom operators and industries associations. 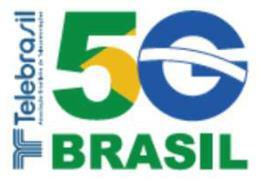 The main goal of 5G Brasil is to promote the development of 5G ecosystem in Brazil through: enabling and establishing the communication between the ICT sector and all spheres of government and regulatory agency in Brazil; looking for financial support for the promotion and use of 5G technology; promoting national and international cooperation agreements for 5G technology development and adoption; establishing and maintaining open interaction with non-ICT organizations, also called vertical sectors; sharing information regarding 5G technology among Members and Associates in line with compliance and legal limits; representing the common interest of the members, when requested, in national and international forums related to 5G. The organization of 5G Brasil consists of a Steering Committee and five thematic commissions: infrastructure, regulations, research and use cases, spectrum and standards. 5G Brasil is headquartered in Rio de Janeiro. The Fifth Generation Mobile Communications Promotion Forum (5GMF) was founded on September 30, 2014. 5GMF has been conducting research & development concerning 5G (The fifth Generation Mobile Communications Systems): including the standardization thereof, along with liaison & coordination with related organizations, the collection of information, and the dissemination & enlightenment activities. Towards 5G realization by 2020, these activities will contribute to the sound development of the 5G Eco-society. The Ministry of Science, ICT and Future Planning and mobile industries in Korea founded the 5G Forum in Seoul on May 30 2013. 5G Forum members consists of public and private sectors, including mobile telecommunication carriers, manufacturers and academic professionals. The goal of the 5G Forum is to assist in the development of the standard and contribute to its globalization. By 2020 the South Korean government intends to commercially deploy 5G mobile telecommunication technology for the first time in the world featuring five core 5G services during the Pyeongchang 2018 Winter Olympics. This would include social networking services; mobile 3D imaging; artificial intelligence; high-speed services; and ultra- and high-definition resolution capabilities; and holographic technologies. SeongMok OH, President of KT, is chairperson of the forum. The Electronics and Telecommunications Research Institute (ETRI); three major telecom companies; and several major electronics companies, including Samsung Electronics, LG electronics, TTA, KMW were appointed to the Board as co-chairs.